Nelson Irrigation has been manufacturing irrigation products for over 40 years now. By bringing the TWIG® Wireless Control System to the table, we are giving you the tools to better utilize the precision-engineered nature of our products. By automating Nelson sprinklers you can introduce sophisticated watering schedules to your operation to save water, chemical inputs, and energy while also enhancing yield and grade. The TWIG® system is currently automating a variety of irrigation types. The R2000WF Rotator® is providing highly uniform water applications in short set cycles to promote better germination and irrigation on carrots in California. The Big Gun® Sprinkler is providing dust suppression on copper mine tailings in the West - while also mitigating dust problems on quarries and feedlots. Major labor savings are being seen on automated systems where Solid Set Big Guns are irrigating forage crops. Tree and vine sites across the Pacific Northwest are finding automation an unbelievable tool that can actually help optimize first-year tree growth and mitigate alternate bearing tendencies. New automation technologies will not eliminate the need for systems to be checked, but they will improve precision of irrigation and thus reduce pumping and fertilizer costs. Furthermore, these new systems will log data for each irrigation event. This information can be used to evaluate the performance of irrigators and the effectiveness of irrigation scheduling decisions. 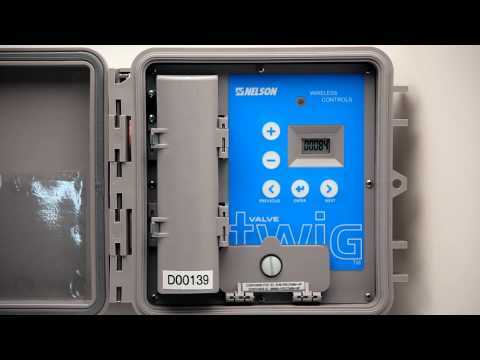 The TWIG® Wireless Control System is only intended for Solid Set and permanent set applications — and does not enter into the world of mechanized irrigation, as these systems already have built-in automation.